These bars are seriously MY FAVORITE ever! They are the #1 request of my husband and his “Sea Donkey” surf crew because there’s nothing better on a road trip or for a work-out recovery. I enjoy making them for new Mom’s, to me they were the most satisfying snack and nursing a newborn always made me feel totally famished. We often use them as just a quick on the go breakfast or afternoon snack. The only other bar I make are the Chocolate Date Nut Bars I posted a few months ago. Those are amazing, but more of a smooth chocolate treat, whereas these have all sorts of dimension with chewy dates and coconut, crunchy almonds and other nuts, plus hearty oatmeal and melty chocolate. I always double this recipe, then I cut and wrap them individually with plastic wrap and put them in the fridge. We eat them for weeks – and you can wrap them then freeze them too! They freeze beautifully which is another reason I always make as many as I can. 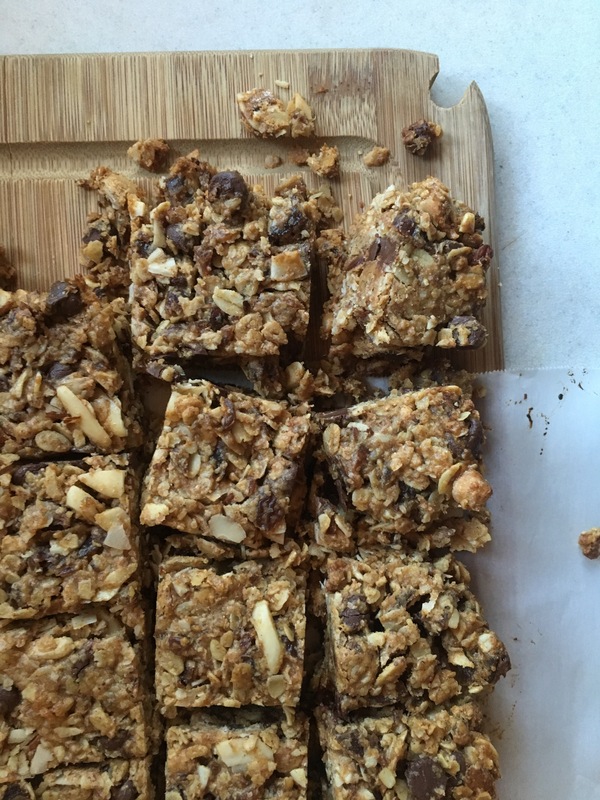 The original recipe was from Smitten Kitchen – her almond date breakfast bars were the inspiration, but I’ve made a number of changes over the years to make them my own. This a recipe begging to be messed with – sometimes I add other nuts like those Trader Joe’s coconut cashews, or pecans, and sometimes I will add another dried fruit such as tart cherries or apricots – it always turns out epic. Have fun and make it your own. I’m certain you’ll love them as much as we do! Preheat your oven to 350. Line an 8×8 pan with parchment laying it in an X going first in one direction than perpendicularly in the other so you can easily pull out your bars when they are done. I almost always double the above recipe and bake them in a 9×13 – but we eat these for days and like to have enough to give away so suit yourself. Stir together the dates, oats, flour, wheat germ, almonds (or whatever nuts you’re using) coconut, and chocolate chips. In a separate bowl whisk together the salt, cinnamon, almond butter, coconut oil, honey, and extracts until smooth. Pour the wet ingredients over the dry ingredients and stir them until the dry ingredients are evenly coated. Spread the batter in the prepared pan, pressing firmly into the bottom, edges and corners to ensure they are molded to the shape of the pan. It’s handy to use a piece of plastic wrap or parchment while you do this so your hands don’t get super sticky. Bake the bars for 20-25 minutes until they are brown around the edges and there’s a little color on the top too. Cool the bars in their pan placed on a cooling rack. After 20-30 minutes you can pull them up with your parchment sling and put that on the rack to speed the cooling process. I recommend cooling them in the fridge for about 30 minutes before cutting. I forgot to do this last time, which made them a little crumbly when cutting. If they are a little chilled they are easier to cut. I like to take the cut bars and wrap them individually then put them in a gallon bag in the fridge or even freeze half of them and enjoy them for weeks and months! Recipe adapted from Smitten Kitchen Almond Date Breakfast Bars in The Smitten Kitchen Cookbook by Deb Perelman. 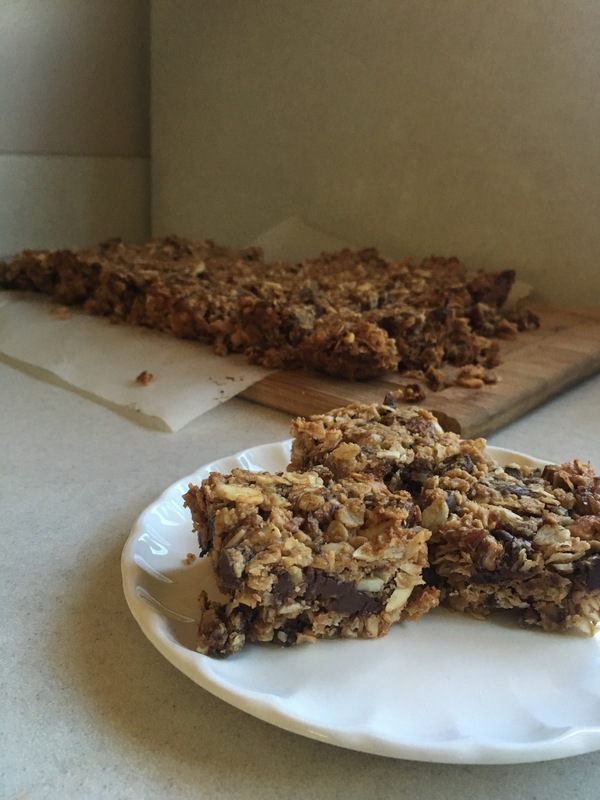 This entry was posted in Bars, brownies and bars, favorites, Uncategorized and tagged coconut chocolate date granola bars, date nut chocolate granola bars, homemade granola bars. Bookmark the permalink.